This past weekend, I had the pleasure of participating in Toronto’s 2017 DementiaHack, organized by HackerNest, an international tech community, and presented by Facebook. CS4 – Researchers who are investigating dementia. My team's idea was a financial projection/planning app for CS2 - caregivers of people with dementia. According to surveys, finances is one of the [leading sources of stress for Canadians (1)]. [Half of Canadians] lose sleep over worrying about finances and a comparable number are embarrassed about their lack of control over their finances. These worries multiply for those who must care for people with dementia. According to a study by the Alzheimer Society Canada, the projected costs of dementia may increase one's personal expenses by [550%]. This is in addition to the [19.2 million hours] of informal unpaid time that caregivers must spend, often giving up hours of paid employment, to take care of their loved ones with dementia. With these concerns in mind, we rationalized that a digital tool which helped caregivers prepare for the costs of dementia would be beneficial. 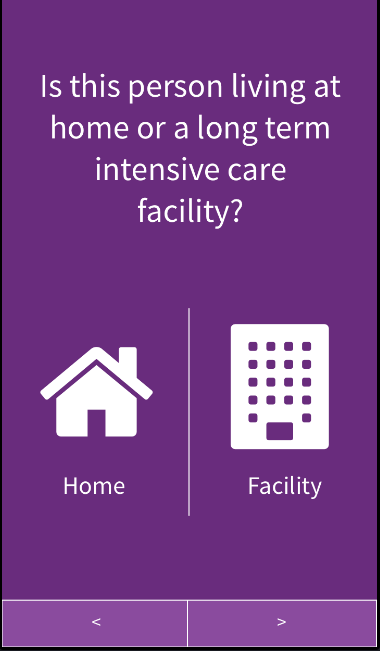 In particular, we wanted to be able to help caregivers anticipate increases in costs, which were difficult to predict due to the [irregular rate of degeneration of dementia]. Our research phase consisted of two parts: (1) qualitative research: interviews with caregivers of people with dementia who were Mentors/Judges at the DementiaHack, and (2) quantitative research: gathering numbers for the costs of products and services in Ontario that dementia patients and their caregivers may need. From these insights, we concluded that our app would have to rely on user generated data and occasional assessments to map anticipated costs. It would be too difficult to provide a profile for projected costs from a one-time assessment, due to the high variance of decline between individuals. Instead, the app would use caregiver input about new or changing symptoms to tack on expected expenses, corroborated with some average rates of decline data from academic research. Over time, as the user base grew, it would become possible to have a larger body of data to draw from, one which could combine a timeline of caregiver inputs with a timeline of financial spending to generate timeline projections based on dementia symptoms. We also obtained a list of potential income sources that caregivers could also include in their assessment, to offset the added costs of dementia. These often included pensions, retirement savings, and insurance that would kick in for the patient with dementia, who was often a retiree. 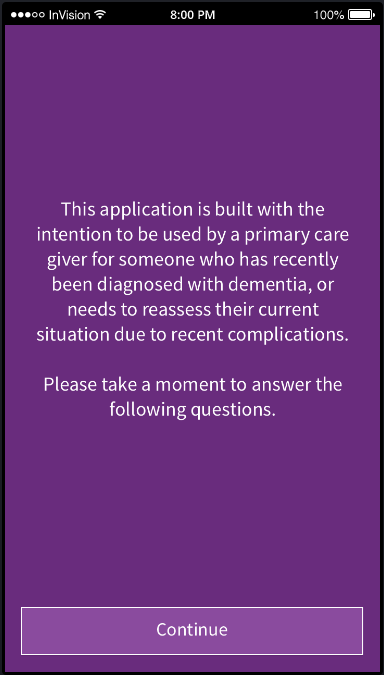 With the 30-hour limitation of DementiaHack, our prototype app slimmed down some of the features we'd hoped to implement. We left out the sources of potential income, visualizations of cost projection, and a timeline for costs. We simply did not have the time available to develop these features. Instead, our prototype app was mainly a research aggregation and simplification app. Having done a lot of financial research, we turned our long list of expense factors into a short user-friendly survey that asked relatable questions about the caregiver's experience and their loved one's symptoms. The answers from this needs-based survey would then feed into our expense factors and generate a tally of expected expenses the caregiver may have to face. With the stress of facing finances on top of an unpredictable degenerative disease, we thought that navigating the complexities of multiple websites, publications, and resources could be overwhelming. Thus, we hoped our prototype app would be a simple tool that could relieve this stress by translating financial and economic jargon into the day-to-day problems caregivers actively face. Accessible: we chose a colour palette of hues and purple, to anticipate users who may be colour-blind. We also chose large and clear type. Friendly: we used simple language and short sentences that would give caregivers the information they wanted without overwhelming them. Respectful: often, the elderly are treated in a patronizing way - we wanted to avoid this by creating a no-nonsense app that presented simple features in an intuitive way. We wanted to avoid the kind of "help text" that may make a user feel as if they are being lectured to. To accomplish these things, we created a mock-up with simple navigation: three tabs at the bottom split into "Survey", "Assessment", and "Projections". The Survey section stored the caregivers' answers to our survey about their needs, and links to take the survey again or change their answers; the Assessment stored a categorized list of expense items typically associated with dementia care, with the items relevant to our user toggled on; and the Projections page showed a simple budget divided into one-time expenses and monthly expenses. On a user's first visit to the app, they are shown a screen that invites them to take the intake survey to assess their needs. The welcome screen to a first-time user inviting them to take the intake survey. The survey showed large print and large icons for the user to tap as their response. Navigation also involved large contextually-placed buttons at the bottom of the screen. The assessment page showed a breakdown of the costs that the app had determined the user may need. The user is free to adjust these cost here. In the full app, these options would also have "question" icons next to them for users to tap for more information about the item and its cost, and the user would be able to expand each item to finetune its cost. In the prototype, we used boolean toggles for simplicity. On the Projections page, a sample budget is provided that accounted for the initial costs and monthly costs that a caregiver would have to account for. Finer-Grain Surveys: judges asked if it would be possible to have more surveys or a finer-tuned survey to tackle more complex details in caregivers and their charge's lives. I definitely think that the survey could be split into multiple short surveys, borrowing questionnaires that clinicians use to diagnose dementia phases, in order to project costs. Unclear Functionality of Assessment Toggles: At present, it is not obvious that the assessment toggles are linked to the survey responses and to the projections - it may be confusing for a user that after doing a survey, there is this additional step listing a bunch of cost items. It can be unclear why it is relevant at all. When do initial costs happen? 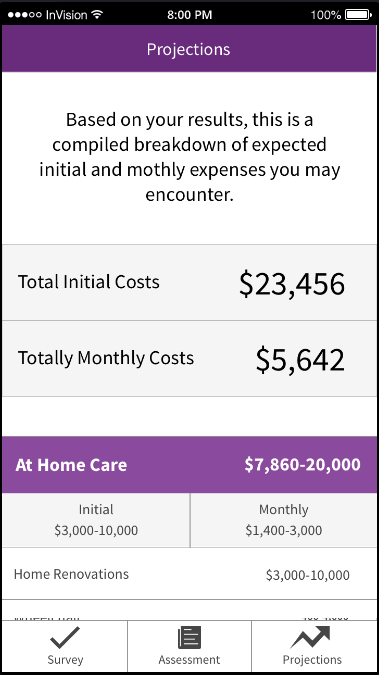 Some initial costs happen before others - it is unclear in this app if those costs listed are all taking place in one month or in one year, or any other time frame. Skipping the Survey? The user loses some control in the beginning of the app, being forced to go through a survey that may include questions they are not sure about. There is no option to skip the survey to get used to the idea of the app first, or any help context for more guidance on how to answer each question. User Privacy: Some survey questions can be quite personal - there is no log-in screen or security measures in place to protect sensitive user data.